KOKOMO, Ind. – What a difference a week makes. After starting the season with five consecutive losses, the Indiana University Kokomo women’s volleyball squad is beginning to meet its lofty pre-season expectations. Two days after its first win of the season, the Cougars made it an official winning streak with a 25-14, 26-24, 25-23 victory over Goshen College. The Cougars wasted little time in exerting its Cougar Gym home court advantage. After giving up the first point of the night, IU Kokomo soared to an 18-7 lead thanks to solid net play and a defense that Hayes said is quickly improving. “I think we came out engaged for this game,” she said. The Cougars looked to be on the way to an easy win in game two, leading 11-8 and continuing its strong defensive play. But Goshen showed some life and scored nine of 10 points to eventually lead 19-14. 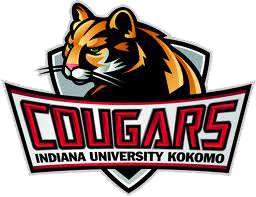 A kill from the strong arm of freshman Lexi Brickner (Wabash, Ind./Southwood) pointed Kokomo in the right direction, and back-to-back kills from Micayla Speidel (Columbus, Ind./Columbus East) pulled the Cougars to within one. Kokomo tied the contest three times down the stretch but found itself trailing 23-24 with Goshen serving. A strong play at the net by Kokomo’s Keeana Walton (Peru, Ind./Maconaquah) put the ball in the hands of server Casey Colgate (Indianapolis/Lutheran), who scored the final two points of the game thanks to a block from Walton and a soaring kill from Lindi Thomas (Parker City, Ind./Wapahani). Kokomo again found itself with a quick 10-5 lead in the third game, only to allow Goshen to tie the contest at 18. The Maple Leafs (2-2) and Cougars would battle through four ties and three lead changes in the stretch run before Thomas sealed her second consecutive game with another kill – giving the Cougars its second win in three nights. Thomas led Kokomo with 14 kills (.233 hit percentage), 13 digs and a pair of aces. Speidel had eight kills and Elyse Younger (Fishers, Ind./Fishers) added seven. Setter Cortney Hanson (Logansport, Ind./Pioneer) ran the offense with a team-high 18 assists and an ace while libero Lael Larrick (Denver, Ind./North Miami) had 20 digs on defense. Kaleigh Ensley (Fort Wayne, Ind./Snider) finished with 14 digs and two aces. Colgate had a solid night with 12 assists and four digs. The Cougars (2-5) hit the road for a three-game trip before returning to Cougar Gym on Sept. 11 for Military Appreciation Night. All veterans and active duty service personnel will be admitted free for the 7 p.m. contest against Indiana University East.